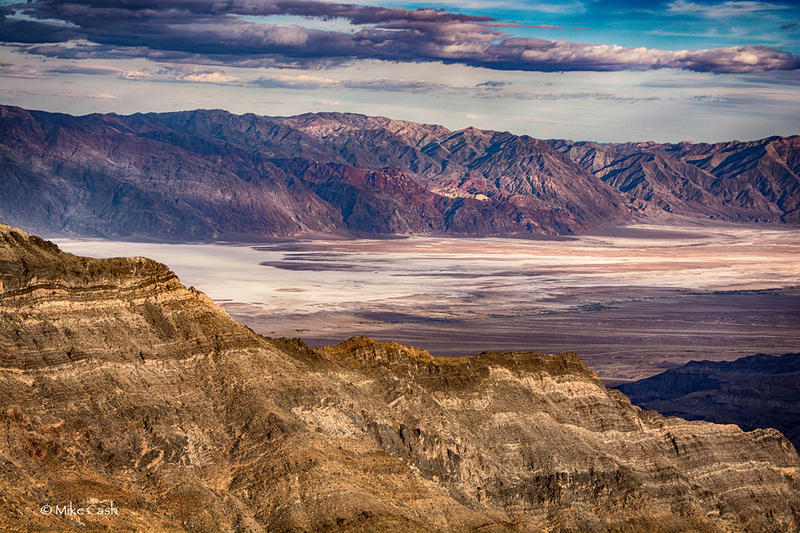 Death Valley has long been on my bucket list of places to explore. A few months ago my photographer friend Dee said to me and other friends "Who wants to go to Death Valley the last week in March?". Oh yeah, I jumped at that chance! My only disappointment was that my wife Joni could not go with me due to work. Joni and I knew that someday I would be making solo trips so it wasn't unexpected. We ended up being a group of 7. I was the rebel chosing to camp in the Nomadacy Support Vehicle (NSV) at Fiddler's Campground at Furnace Creek Ranch rather than stay in a hotel. I wouldn't call the campground an idyllic setting but I knew daylight hours would be spent exploring and shooting. All I needed was a place to park the NSV while eating and sleeping. I would have preferred to boondock but it is not allowed in day use areas and along major roads of the park. As I’m sure you know Death Valley is a place of extremes, as in extreme elevation changes, extreme temperatures and yes, extreme beauty. Monday was a day of extreme wind. The entire trip over was quite windy. We had planned to photograph at sunset in the Mesquite Sand Dunes near Stovepipe Wells. I suspected that was out of the question and while driving from the campground to Stovepipe Wells I saw the edge of the sandstorm over the dunes confirming my suspicions. Dee met me in the parking lot and we talked for a few minutes while trying to stay upright in the wind gusts then moved indoors for dinner with our friends. Edge of the sand storm. 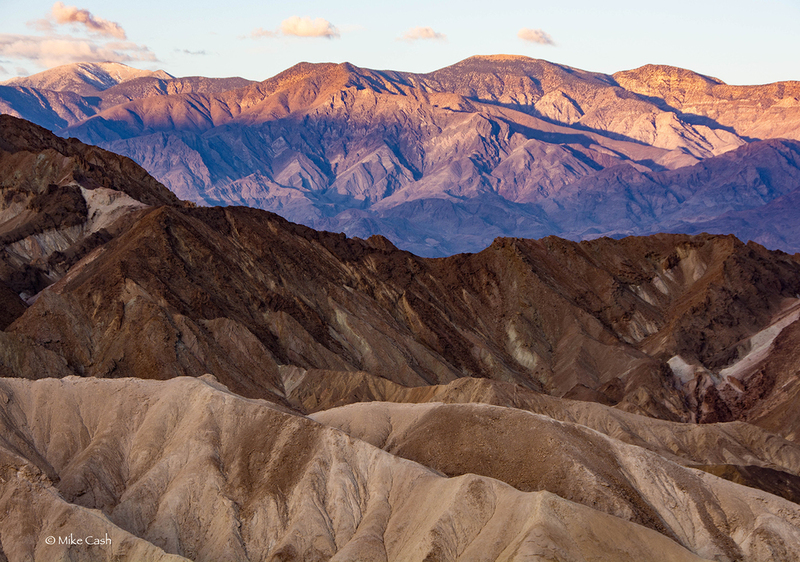 Zabriskie Point at 713 Ft. elevation is an iconic location easily accessible along highway 190. We met there early (along with a lot of other photographers) to shoot the sunrise. Its easy to see why this beautiful area of badlands is so popular. After the early morning light was gone we drove to Dante’s View a drive of more extremes. After 13 miles of driving uphill including a narrow road ending with a 15% grade for the last quarter mile we stepped out of our vehicles to wind and a temperature of 43 degrees! The view was extreme too as we looked down from 5475 ft. elevation onto Badwater Basin, a salt flat at 282 feet below sea level, the lowest point in the country. In the afternoon I met another member of our group to explore Artist’s Drive and Artist’s Palette. At our first stop I saw wildflowers and headed straight for them. For me wildflowers are creatures of extreme beauty. This year is rare in Death Valley as exceptional winter rains had resulted in a “super bloom”. I had read the peak of the super bloom was over in the lower elevations but there were wildflowers blooming at 2000 to 3000 feet. This seemed to be confirmed on the drive to Dante’s View as I had seen many wildflowers but it was too windy to shoot them. I looked around a dry wash full of flowers and there it was, a Desert Five Spot! While the Desert Five Spot is not rare it’s uncommon as compared to other wildflowers and is quite beautiful. Again I was struggling with wind but I did’t want to pass up this opportunity. I made a couple of shots that are perhaps not my best wildflower photos but I thought them good enough to share. We moved on around the drive until we found Artist’s Palette. This another iconic area and we scouted it making plans to return for sunset. Later we found our the rest of the group wanted to shoot Badwater Basin at sunset so decided to shoot Artist’s Palette on Wednesday. Please click on any photo in the gallery to open. Use the arrows to move through the gallery. Roll over a photo for title and description. The group plan was to shoot sunrise at Mesquite Dunes followed by an afternoon trip to The Racetrack. Ok it’s time for me to be honest about sunrise. I will agree that the best times for landscape photography are sunrise and sunset. However, I am not a morning person and I have found that shooting both sunrise and sunset day after day wears me out quickly. I woke up Wednesday to an early alarm and said “Nope, I don't think so.” For me it was a good choice. After breakfast I headed north with Mosaic Canyon as my destination for no particular reason except it sounded interesting. Since I was on a solo adventure again I stopped at anything I wanted to see. Harmony Borax Works and Mustard Canyon was first followed by Salt Creek. I learned that Salt Creek is more saline than the ocean! Also I didn’t know there are fish in Death Valley. The creek is the only home of the Salt Creek Pupfish. The creek itself only flows in the winter and spring but the pupfish reside year round in the spring-fed pools of Upper Salt Creek. Mosaic Canyon was at the end of a rough road and was quite busy. Nonetheless I had a good four mile hike in an interesting place. I do want to see The Racetrack someday but this day I couldn't get excited about the long trip to The Racetrack. I headed back south with a drive on West Side Road in mind. I was disappointed to see the road closed. It turned out that all the wind had formed a big sand dune across West Side Road causing it to be closed. I continued south on Badwater Road. The next stop was Devil's Golf Course. I'm not sure where that name came from. It's a part of Badwater Basin but the salt is mixed with mud to form large lumps and bumps somewhere between ankle and knee high. Signs warn not to walk in the area as falls and broken bones are a possibility, Yep, I could see that! Next up was Natural Bridge. Natural Bridge Canyon is through an area of what I call aggregate, rocks and gravel in compacted mud. The bridge itself was a little anti-climactic after having seen natural sandstone bridges in Utah but who can complain at being outside and hiking 2 miles? Next was sunset at Artist’s Palette. There had been clouds and sprinkles in Natural Bridge Canyon. As I reached the paved road again I looked north and saw heavy dark clouds in the area of Artist's Palette. I turned left instead of right. Artist’s Palette would have to wait for another time. Past Badwater Basin the road is much less travelled and I appreciated the solitude. I looked to my left and “Wow! The super bloom is still alive!” Yellow flowers formed a carpet from the roadside to the base of the Armagosa Mountains and evening light was starting to play on the mountainsides. It was beautiful. Further on as twilight came on I found a small salt marsh. The water was shallow enough that the geometric patterns the salt can form were starting to show but the water still reflected the sky. A wonderful sight in the quiet stillness of twilight. I turned back toward camp and stopped a couple more times to shoot the twilight before darkness fell. Yeah it was a good day! I took it easy in the morning and visited Harmony Borax Works again as I hadn’t looked at it in detail on my previous visit. A lot of history happened there in the short 5 years is was in operation. We decided to meet for lunch at the Furnace Creek Inn as it might be the last opportunity to be together before returning home. It was a great lunch at a really nice restaurant. We talked about the rest of the day. I said I was planning to shoot sunset at Aguereberry Point. Everyone one else liked that idea and we agreed to meet there. I took off in the general direction of Aguereberry Point with the idea of exploring whatever looked interesting on the way. Skidoo was one of those “whatever” explorations. Skidoo was a booming mining town in the early 20th century. One and a half million dollars of gold was mined from the area. In roughly ten years Skidoo had come and gone. Now all that remains is a few pieces of glass and metal laying around in a place that once had a post office and a bank. I was the first to arrive at Aguereberry Point (6433 ft. elevation). The road had been narrow and rough. The last little bit was very steep and narrow with a long, sharp drop off on one side, however, the view from the point was quite a reward! There were a few clouds in the west causing the evening glow to light up then re-light areas of the Armagosa Mountains across the valley. It was a spectacular show that changed by the minute. Such a show was worth the long drive out and the long, very dark, drive back. Well I decided to stay in Death Valley another week!! April Fool's!!! The great adventure was over. I made the long drive home arriving tired but happy to see my wife with great memories in my head. Will I return to Death Valley? There's no need for that question!! I saw and and experienced much but it was only a small part of what is there. Next time Joni will be going too!